Circumcision - How do I Find Someone to do it? For neonates, most obstetricians will perform a circumcision as part of the overall service to their patient, the mother. Failing that, there are many pediatric surgeons who do circumcisions. There are also clinics where circumcision is one of the major, if not the exclusive, activity. Many other doctors, including general practitioners will do circumcisions. So will nurses [Palit et al., 2007]. 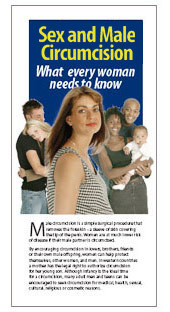 However, level of expertise and practice (frequency of carrying out the procedure) should be an important consideration by parents in seeking someone good. Circumcision is very simple technically, but despite this a circumcision has to be done by someone who knows what they are doing. In the USA, 54% of doctors involved in the delivery or care of infants perform circumcisions [Stang & Snellman, 1998]. The breakdown is: obstetricians 46%, family practitioners 29% and pediatricians 25%. A department of obstetrics in Michigan off-loaded circumcisions to the department of pediatrics in the same hospital; this had some advantages, where, of course, the mother is the obstetrician’s patient, not the baby, and so doing would thus allow follow-up by the specialty most suited [Johnson et al., 2007]. For adults a urological surgeon will often be the person to consult with, or a general surgeon. The man will need a referral from a doctor in a family practice, general practice or another physician. Again, being so simple, there may be other doctors who are not surgeons who can do it. So to find someone, the man needs to think about who he might ask first from his own knowledge and contacts. It could be his local doctor. There are also men's health centres/clinics that specialize in such male-specific matters, and are used to handling enormous numbers of enquiries from men who want to get circumcised. So if you are an uncircumcised male and think this is what you want, don't be shy! ... Ask! It is easy to find someone to do it in the USA and many other countries. If you need help click the menu bar items "CIRC CLINICS WORLD" and "CIRC CLINICS AUST & NZ". Guidelines published by the General Medical Council in the UK in 2008 state that “[doctors] must assist a family wanting a male circumcision”, pointing out that “there is no room for a pulpit in the surgery should their beliefs differ regarding this procedure”. If you are in the south of England/London area, you are particularly well served, but there are of course others elsewhere in the UK. Cost can be 75 pounds. The reader needs to be aware that there are some doctors who oppose circumcision, due to ethical prejudice, or outdated or erroneous information. This includes medical practitioners who are not aware of current evidence in favor of circumcision as a wise prophylactic procedure. Also, to make short-term cost savings, many tax-funded healthcare systems will not circumcise until a medical problem has arisen - contradicting their usual policy that “prevention is better than cure”. In many countries you may therefore have to seek help in the private sector (see lists and websites above of doctors who circumcise). There you will usually find a more sympathetic and knowledgeable response.